Looking at an old planner, I realized it's been exactly one year that I have been waiting to read Across the Universe. When I saw it in my local used bookstore as I prepared to visit my old school in The Bahamas, I thought it would be the perfect novel to read on the beach and then leave behind for my students. The sexual references will earn it a slot on the "Grade 8 Only" shelf, but I think the students will enjoy Beth Revis' debut novel, probably more than I did. Amy and her parents are being frozen aboard a spaceship headed towards a new planet; they will be thawed in three hundred years, after their arrival on Centauri Earth. When Amy is unthawed fifty years early, she is justifiably angry that she has lost her past, as well as her future with her parents. Then she realizes that by unplugging her, someone was trying to murder her and may strike again soon. 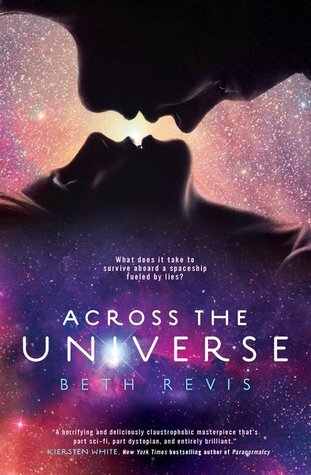 Perhaps I was expecting too much after a year of waiting, but Across the Universe dragged for me. The novel's narration is divided between Amy and Elder, one of the residents of the spaceship who happens to be the only person Amy's age and its future leader. At over 400 pages, too many of the scenes are told from both Amy and Elder's perspectives, which slowed the pace and made me feel like I was reading the same chapter twice. Although they came from different worlds, their interpretations of events were too similar to merit telling twice. My other problem with the book was that the surprise twist was anything but. The hints were heavy-handed, yet it still took Revis until Chapter 70 to make the big reveal. Perhaps my students will be patient enough to wait that long, but I prefer my plot to move more quickly. It wasn't a bad book; the plot idea is very interesting and, well, I can't really think of a second example to support that statement. So I leave the book behind in The Bahamas, shrugging and wishing it was better. I never reviewed The Future of Us...for some reason it hasn't called to me. I did like Thirteen Reasons Why. Yes, four years in The Bahamas and I miss it every day!